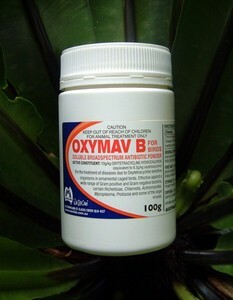 Oxymav B 1 kg This size has been discontinued. 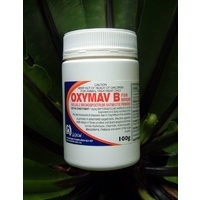 Soluble broadsprectrum antibiotic powder for the treatment of diseases due to Oxytetracycline sensitive organisms in birds. Effective against a wide range of Gram positive and Gram negative bacteria, certain Richettsiae, Chlamidia, Actinomycetes, Mycoplasma, Protozoa and some of the larger viruses. Dosage: Chronic Respiratory Disease (CRD) and bacterial enteritis: dissolve 5g (1 measure) in 50mL of water. Treat the bird for 3 - 5 days, or as directed by a veterinarian. Prepare fresh solution daily and use as the sole source of drinking water.